My folks used a pressure cooker when I was a kid, but it seems like they only used it while canning. 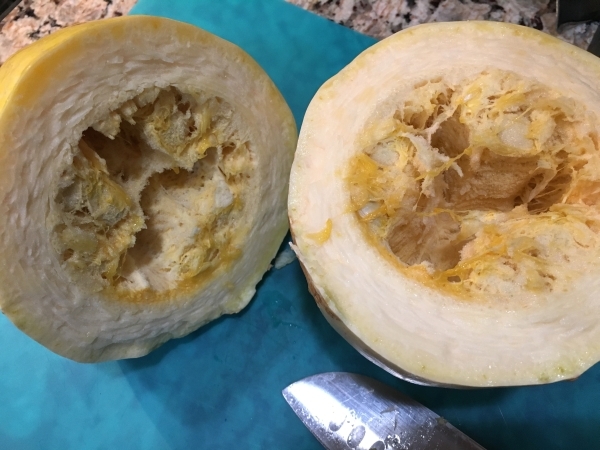 I was always afraid of using one – only because I had heard that they could blow up – But in reality the new generation pressure cookers have considerably more safety features than the ones our parents used; which usually had none. You don’t have to worry about safety with a well designed modern pressure cooker such as the Fagor, which is the brand I recently invested in when I took a class through the local community ed. If you’re not familiar, pressure cooking is the process of cooking food, using water or other cooking liquid, in a sealed vessel, known as a pressure cooker. Pressure cookers are used for cooking food faster than conventional cooking methods, which also saves energy. 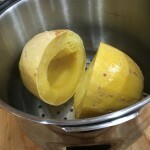 Inside the pressure is created initially by boiling a liquid such as water or broth inside the closed pressure cooker. The trapped steam increases the internal pressure and temperature. 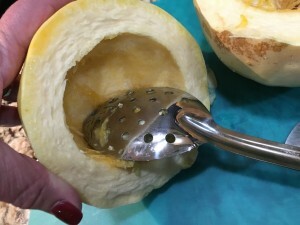 After use, the pressure is slowly released so that the vessel can be safely opened. This method of cooking can be used for quick simulation of the effects of long braising. 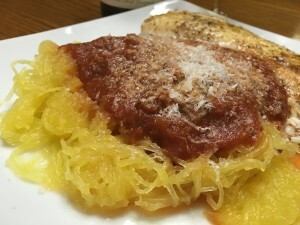 I’ve been experimenting a lot and the spaghetti squash that usually takes about an hour to roast turned out terrific in a fraction of the time! This is a very easy process! 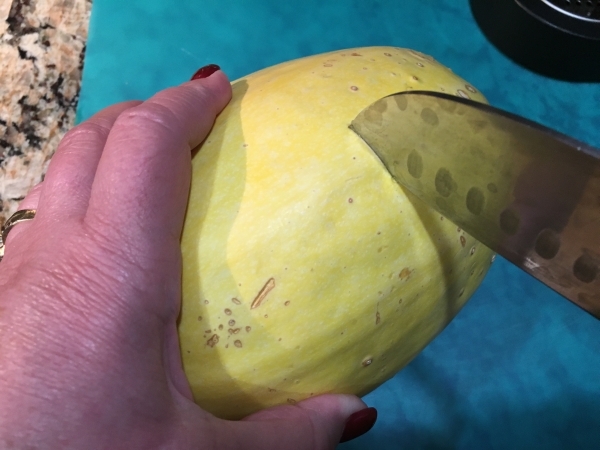 Carefully cut squash in half. 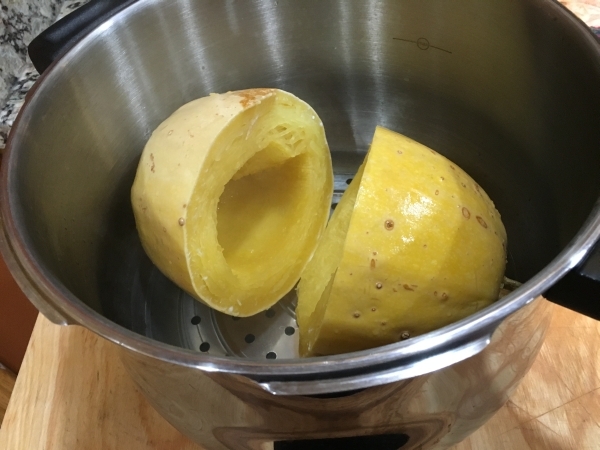 I chose to do it the short way so that I could fit it in my pressure cooker. 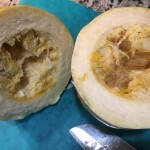 Use a spoon and scrape out the seeds and inners. I like to toast the seeds with a little olive oil and salt and use them on salads. Add about a of cup water to the bottom of the pressure cooker and add trivet. 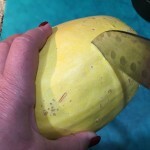 Place the squash halves in, cut side up (or, however, not to exceed your fill line). Cover pressure cooker and bring up to full pressure. Reduce heat to stabilize pressure and cook for 15 minutes. 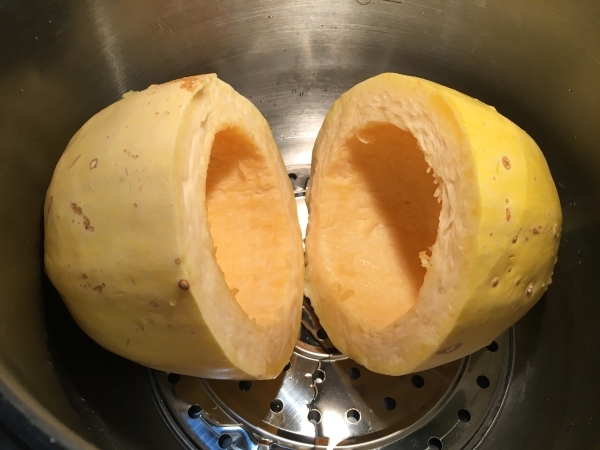 Once finished, release the pressure and allow all the steam to escape. 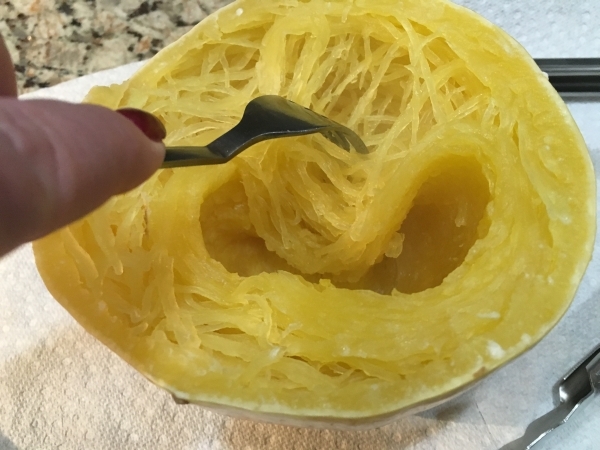 Using a fork, rake out the strands of squash and transfer to your dishes. 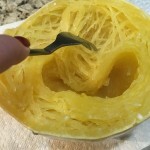 If there is alot of excess liquid, place the strands in a colander and press lightly. 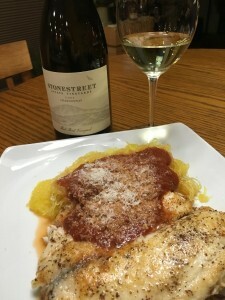 Top with your favorite pesto sauce and serve hot. This was a side dish to simple pan fried fish. 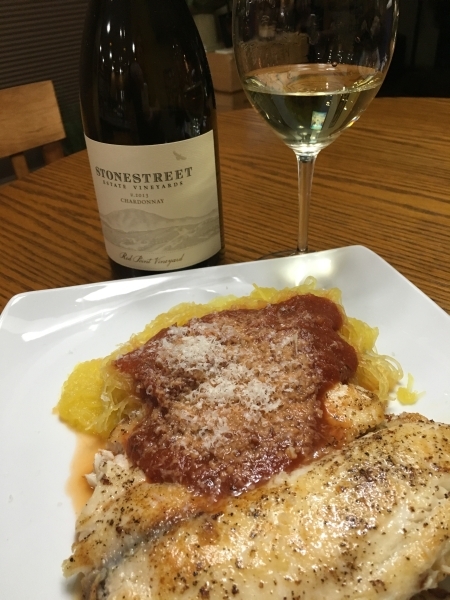 We paired this meal with a wonderful 2013 Stonestreet Chardonnay!